One of the challenges that the Macalester College coaching staff face is that the academic standards at the school are so high that many of the athletes they would normally like to see suit up in a Fighting Scots uniform are denied to them long before they can even say hello to a prospective student. This means that they have to go the extra mile to find an exceptional student-athlete who not only stars in the classroom but also has the skill set to be a difference maker on the field. This often means that they have to go to extensive work to track down the very best of the best. 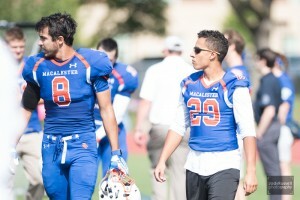 Long before deciding that Macalester College was the place he would go to further his academic pursuits, Fabian Arrizon was already making a name for himself, both on the field and in the classroom. The Mount Eden High School graduate was a recipient of the National Football Foundation and College Hall of Fame Scholar-Athlete Award, earned East Bay Officials Association Award for Outstanding Academic and Athletic Performance Award, as well as winning the All-Academic Varsity Award. He was a Dean’s List recipient and named to the Hayward Area Athletic League Defensive First-Team. As he entered his senior year, Fabian was aware that his academic success would make him a highly sought after recruit for many colleges, and he began his college search looking at the University of California system as well as Ivy League schools. While those colleges and universities appealed to him, he wanted to make sure that he could play football as well. 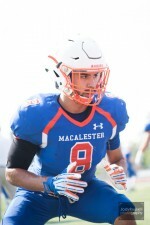 As he was beginning to narrow his choices, the Fighting Scots head football coach, Tony Jennison, reached out to Fabian wondering if he was interested in coming to Macalester to continue his academic pursuits. He was excited that Coach Jennison was interested, but had to ask himself where in the world was Macalester College? The opportunity to play at Macalester really had Fabian’s attention and so he had to do one of the things he is truly exceptional at – study. Coach Jennison also offered Fabian something that was very important to him. 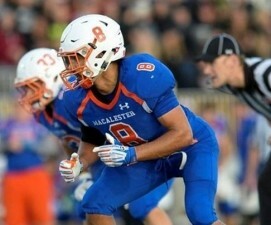 While not having professional aspirations, he still wanted to play football, and Macalester looked like the ideal place to continue his athletic career. The decision became a no brainer for the future Fighting Scot. Macalester was the place for Fabian, but he knew he had one major hurdle to overcome – what his parents were going to think about him moving 1500 miles away from home? While concerned about their son being so far away, both wanted what was best for their son, and meeting and getting to know Coach Jennison made a big difference to the whole family. Fabian was sold that Macalester was the spot for him, but he did have one pressing question. One of the most important decisions that a student will have to make in their life is what will be his or her major. For many they choose an option and stick with it, taking that pathway all the way to their career field. For others, they learn in college that what they had envisioned for themselves when they first came to the school is not what they want later on. While the option to change majors is available at any college or university, doing so at some can become quite costly and extend the time they are in the school. Other institutions make sure that they do all they can to help the student to have the best chance to succeed and to do it on schedule. This was the challenge that Fabian was facing. He entered Macalester College as a political science major, but realized that economics was more in line with what he wanted to do. He not only is about to finish that major, something he feels he will do well in, but has added an additional area of focus along the way. Macalester College gave Fabian the opportunity to easily switch his major while still remaining on schedule to graduate in four years. They have prepared him to move to the next phase of his life, now he is just trying to figure out what that exactly will be. As he prepares to move onto the next phase of his academic career, he is thankful for the opportunities that Macalester College has given him. He has recognized that the lessons they have taught really opened up his mind and gave him a chance to explore the world like never before. One of the things that Fabian has loved about Macalester is how the college has made the school a lot bigger than the sidewalks and perimeter that surround it. It has opened doors to him so that he can experience what is out in the world. To accent this point, he is reminded of a specific example that depicts exactly what he is talking about. “What makes it easy is their willingness to give you the abundance of information,” he adds. 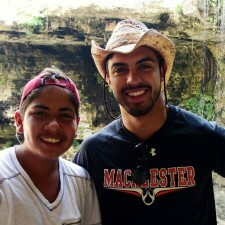 Of course, one of the primary reasons that Fabian wanted to come to Macalester was to play football. Thankfully, for him, his experience on the gridiron has been an exceptional one, something that players at the school have come to expect. His coaches and teammates have become an integral part of his life and made football a huge part of who is as a person. Through the years his time on the field has grown. Fabian did not play a lot in his freshman season, as he was acclimating himself to the rigors of college football. However, one play made a huge difference for him, and has left an indelible mark even today. In his sophomore season the coaches moved him to outside linebacker, and he played in four games, making six tackles and forcing a fumble. His junior season, Fabian was an integral part of the linebacker rotation, appearing in all 10 games, making 24-tackles, an interception and 5 pass breakups. The senior played in nine games this past year and was a real force. He finished with 42 tackles, including a season high nine against Ripon. He also had an interception and blocked a kick. He always seemed to be involved in plays, which Fabian truly understood was important since he was one of the leaders of the team. So How Did He Get That Nickname? Many players will remember key plays they made in games or big moments in victories, but a memory that stands out most to Fabian Arrizon is the nickname he was given his freshman year. It has become a lasting legacy for many reasons. It is likely that 20 years from now, if he was to call up a teammate, they would still be calling him “DJ Fabio.” That may be a legacy of his time at Macalester College, but so will many other things. One of the things that teammates and coaches have come to respect and appreciate about Fabian Arrizon is the fact that he rose to every challenge presented to him. There was no quit. No complaining. No desire to make excuses. He embraced the challenges and took full advantage of every opportunity he received, both on the field and in the classroom. The results are a guy that players and coaches knew they could depend upon. At this point Fabian is not really sure what his career path will look like. He knows he is well prepared and has a real fervor for his areas of interest. With his genius and dedication there is no doubt he will be a huge success in the private or public sector, or both if he so chooses. Who knows, DJ Fabio may even make it big in the music world. Maybe those seniors knew something he didn’t.